The Texas Attorney General's office has sued the company that operates a Houston-area chemical plant where a fire burned for several days, leading to health and environmental concerns. Attorney General Ken Paxton said in a statement Friday that the state would hold Intercontinental Terminals Company "accountable for the damage it has done to our environment." The lawsuit demands civil penalties of up to $25,000 per day for unauthorized air pollution, outdoor burning of chemicals and emissions of dark plumes that spread for miles. It was filed in state district court in Travis County. The company did not immediately respond to a request for comment on the lawsuit. The company that operates a Houston-area chemical plant says a new fire has been extinguished about an hour after it began. Intercontinental Terminals Company spokesman Dale Samuelsen said Friday that the blaze was put out around 5 p.m., though video taken from overhead showed crews still spraying areas that were emitting smoke. The flames ignited on the west side of the tank farm, which holds potentially hazardous chemicals including benzene. Earlier, a breach in a dike on the property led to a spill that forced the closure of the adjacent Houston Ship Channel, a key commercial artery. 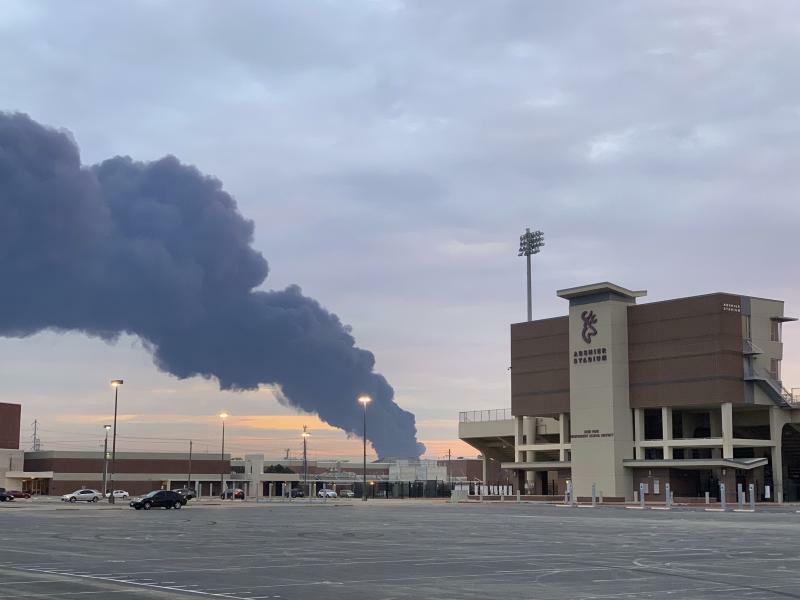 A fire has reignited at the Houston-area tank farm where an earlier blaze sent plumes of black smoke over the Houston area for several days. Harris County's emergency management center says multiple tanks were on fire at the Intercontinental Terminals Company plant east of Houston. It's unclear how large or serious the fire is. Several calls to the company's incident center went unanswered Friday afternoon. Earlier Friday, a breach of a containment dike at the plant forced the closure of part of the Houston Ship Channel. Crews were trying to drain one tank considered to be structurally unsound. There are still significant health and environmental concerns at the site. Among the chemicals stored there include benzene, a highly flammable liquid that can cause headaches, rapid heartbeat and other symptoms. The U.S. Coast Guard has closed part of the Houston Ship Channel due to chemicals spilling from a petrochemical tank farm after a dayslong fire, affecting commerce on one of the nation's most important commercial waterways. The Coast Guard said Friday that it was closing the channel near the Intercontinental Terminals Company plant east of Houston. The company said earlier that a dike wall breached near a damaged tank where crews were trying to drain potentially hazardous liquids. Coast Guard spokesman Kelly Parker says that caused a mix of chemicals, firefighting foam, and soot from the fire to enter the channel. By closing the channel, the Coast Guard hopes to limit the spread of those liquids into the nearby bay. The ship channel connects the Port of Houston to Galveston Bay and is a key waterway for refineries and industrial sites. The company that operates a petrochemical tank farm near Houston says there's been a partial breach of a dike wall containing potentially hazardous liquids. The breach occurred near a damaged tank that crews were working Friday to drain of chemicals that include benzene. The cleanup efforts came after a dayslong fire at the facility was put out on Wednesday. Intercontinental Terminals Company spokesman Dale Samuelsen said the breach occurred shortly before 12:30 p.m.. He says the company has asked industrial neighbors and people at a nearby historical site to shelter in place. The surrounding town of Deer Park has not been told to shelter in place. Samuelsen said workers didn't know what was in the liquids or how it would affect the ongoing process to pump liquid out of the tank. The company that operates a petrochemical tank farm near Houston where a dayslong fire damaged several tanks says it's working to remove flammable product without allowing dangerous emissions to again escape into the air. Brent Weber with Intercontinental Terminals Company said during a news conference Friday that crews are pumping about 20,000 barrels of liquid out of a damaged tank. He says foam will be repeatedly sprayed over the tank to avoid benzene from seeping into the air. The tanks contained components of gasoline and materials used in nail polish remover, glues and paint thinner. People living near the plant in Deer Park were told Thursday to remain indoors after air monitors detected elevated levels of benzene. The order was lifted later Thursday. The fire began Sunday and was extinguished Wednesday.